I am a white male born in the United States. As if through gaslighting, counties around the Midwest were named for tribes that never lived on those lands. These romanticized placeholders may honor the victims of mass trespass and genocide that took place in the colonization of the Great Plains, but more certainly, they were meant to invoke the romance of Manifest Destiny—an imperialist notion which had won out over the Whig’s belief that the mission of the United States was perfecting the democratic enterprise. Jimmie Durham, Upon reflection, I was no longer sure of my position, 2009. Obsidian, German silver (copper, zinc, and nickel), steel table, obsidian mirror with colored tin frame. Mirror: 13 ½ × 10 × ¾ in. (34 × 25 × 2 cm); table: 39 ½ × 197 × 23 ½ in. (100 × 500 x 60 cm); obsidian: 18 ½ in. (47 cm) diameter; German silver: 17 ¾ in. (45 cm) diameter. Hammer Museum, Los Angeles. Purchase. Image courtesy of kurimanzutto, Mexico City. Our lives are profoundly dumb. They seem arbitrary, yet are punctuated by righteous compulsions of immense cruelty that then become the turns of history. There exists a picture of me as a child in a tree, dressed in faux Native American garb made of plastics manufactured in China, purchased at a store run by strangers. I made a useless bow and crooked arrows out of sticks and synthetic line taken from my Dad’s weed-whacker, climbed an olive tree that managed to survive Wisconsin winters, and struck a pose from TV. Children play to explore their world. The world open to exploration by me was a racist, colonialist one. Jimmie Durham had to play in this world too. 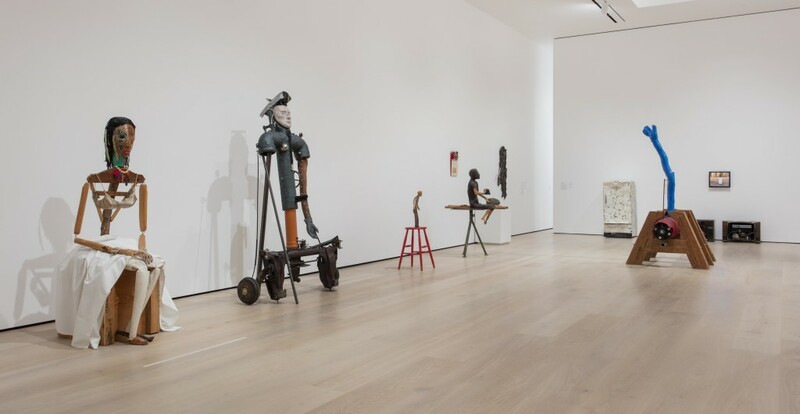 Jimmie Durham: At the Center of the World, Installation view, Hammer Museum, Los Angeles, January 29 – May 7, 2017. Photo: Brian Forrest. Frustration does not seem to even near the type of emotional starting-point for Jimmie Durham. He is not a cynic—his works are too magical , too absurd for kill-yourself cynicism. Durham’s work has a levity that can only be grounded in profound sadness. But this essay is not about justice. It is too late for justice, and Durham’s work suggests that he knows this. How do you give back a continent? How do you reestablish thousands of lost and forgotten cultures, languages, names? How do you reanimate 8.31 million people? Twenty-two years ago, Jimmie Durham left the United States, legend goes, promising to never exhibit here again. At the time, Durham was a member of the Central Council of the American Indian Movement (AIM)—an organizer and activist, as well as a practicing poet and artist. He was on the rise as a member of what Jessica Horton termed the AIM Generation. Then he left. His work can be funny, transgressively funny, like David Hammons’ portrait of Jessie Jackson or Marcel Duchamp’s L.H.O.O.Q. Durham revels in the absurdity of the misplaced. 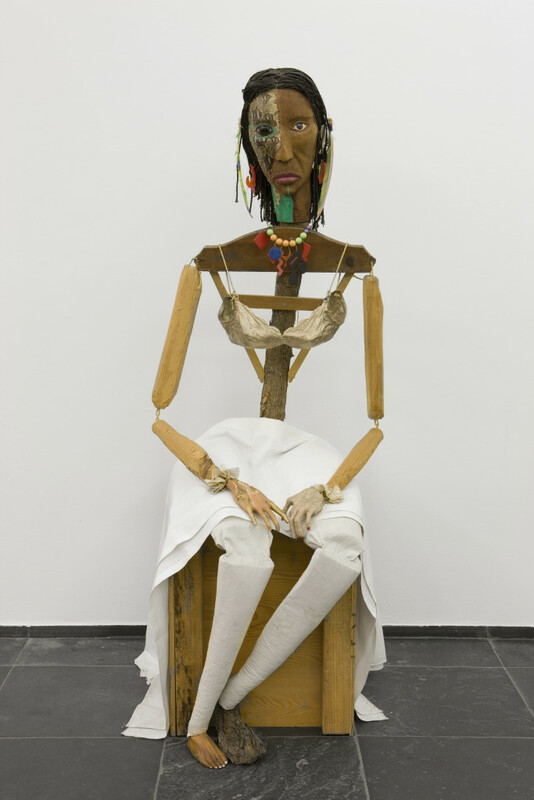 Jimmie Durham, Malinche, 1988-1992. Guava, pine branches, oak, snakeskin, polyester bra soaked in acrylic resin and painted gold, watercolor, cactus leaf, canvas, cotton cloth, metal, rope, feathers, plastic jewelry, glass eye. 70 × 23 ⅝ × 35 in. (177 × 60 × 89 cm). Stedelijk Museum voor Actuele Kunst (SMAK), Ghent, Belgium. Image ©S.M.A.K. / Dirk Pauwels. Durham’s work varies. It meanders like a shallow stream through a cow pasture. His identity is often central, but homages to the art cannon are not uncommon. Brancusi, Hammons, and Duchamp seem to be his favorites. 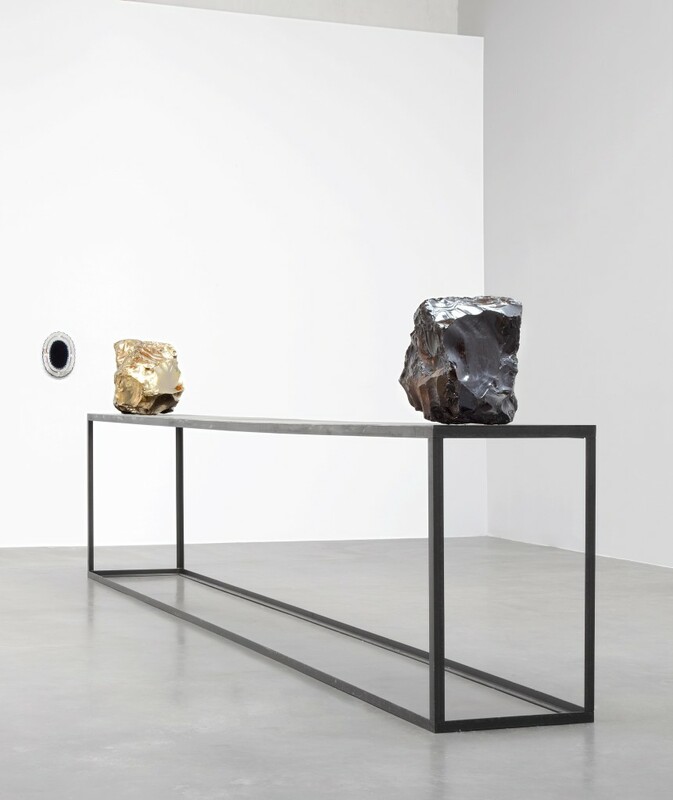 His materials are as varied: glass, stone, ready-mades, canvas, leather, rocks that look like cake. But throughout, there is a humor that looks you directly in the eye and waits. Vitrines provide a perfect pretense. In one such vitrine, The Dangers of Petrification (1998–2007), rocks rest on bare wood or plates, neatly hand-labeled: Petrified Apple Slice, Petrified Potatoes, Petrified Chocolate Cake, Petrified Roquefort. Durham is attracted to what could have been, but is present in what is. There is too a sense of petrification present in his Self-Portrait from 1986. Flattened, discolored and frozen. Labeled for ease-of-use, classified. However, an immutable transformation has taken place. What was gestured to may be hinted at, as with Durham’s canvas Someone Stole My Diamond (1998), but it is no longer knowable. Perhaps this is why there is a sense of melancholic resignation in Durham’s works. Jimmie Durham, Choose Any Three, 1989. Carved ash, magnolia, pine, metal, glass, acrylic paint. 99 ¼ × 49 ¼ × 48 in. (252 × 125 × 122 cm). Hammer Museum, Los Angeles. Purchased with partial funds provided by Susan Bay Nimoy and Leonard Nimoy. Image courtesy of kurimanzutto, Mexico City. Malinche (1988–1992) sits on a throne overlooking the main gallery at the Hammer’s installation of At the Center of the World, the title of Durham’s retrospective. The story of Malinche is a story repeated by colonial cultures. It is the story of Pocahontas. It is the story of the collaborator who by mistake or volition becomes the conduit through which one culture falls prey to another. Malinche’s gaze is hollow but tragic. No. Malinche is a doll, a falsehood. A toy that alleviates the guilt of genocide. So what is, as Durham’s most recent exhibition suggests, at the center of the world? Maybe it is like that chunk of rock that looks like chocolate cake. There was something there, we have to name it, we can see what it looked like then, it is just no longer knowable and that horror— the horror of not knowing—is like a phantom limb, throbbing incessantly. Lately, I feel the need to start all my writing with “I am a white, male,” if I even feel it necessary to write at all. White male culture has plenty of replicators already. “I am empathic. I can be a bridge,” I say to myself. “I need the money,” I say to myself. But intent does not matter. It is a matter of space. Best to be upfront. I feel flattened in my whiteness. My ancestors—a word that seems too ancient to use for my European progenitors—came here after the Civil War, emigrating from Germany to Iowa where they homesteaded, paying what would be around $500 in today’s dollars to claim land that was taken from Native Americans by the Federal government by force and by con. Ellegood, Anne. Jimmie Durham: At the Center of the World. Los Angeles: Prestel, 2016. p. 248. This is an excellent example of colonial thinking, which assigns spiritual characteristics to an individual perceived as more authentic and therefore connected to a plane, a presence beyond the consumable materiality of Western civilization. This is fetishizing the oppressed and is a colonial behavior. I do not want to turn this into an essay backed by a Sarah McLachlan song. That would not do Durham justice. Based on Henry F. Dobyns estimates of pre-Colombian aboriginal population in what is now the United States as calculated by Russell Thornton. Thornton, Russell (1990). American Indian Holocaust and Survival: A Population History Since 1492. University of Oklahoma Press. pp. 26–32. Horton, Jessica. Art for an Undivided Earth: The American Indian Movement Generation. Duke University Press, 2017. Durham, Jimmie. 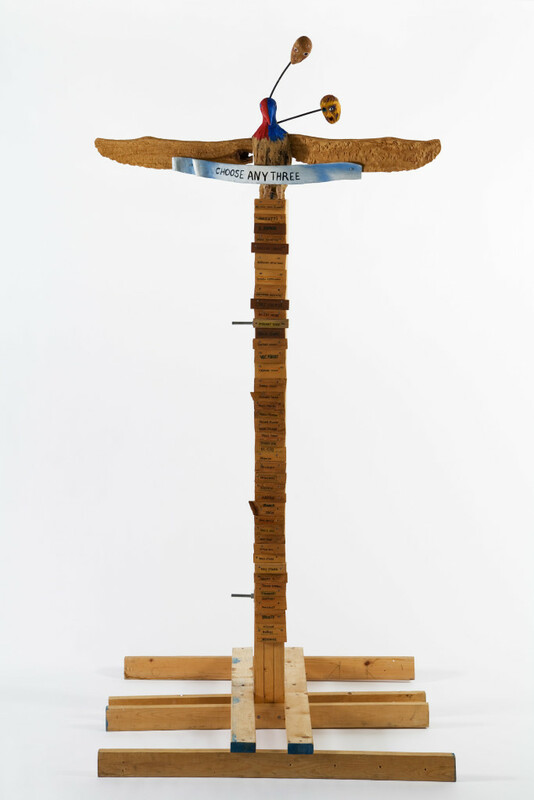 “A Certain Lack of Coherance,” (1988), Jimmie Durham: At the Center of the World. Ed. Anne Ellegood. Los Angeles: Prestel, 2016. P. 248. I am fetishizing the oppressed again. Is Durham fetishizing the oppressed or is it me? It is probably me. We get tragedy. It is like Romeo and Juliet. Like Oedipus. We can project tragedy, like we did on the “Crying Indian Ad” ran by the organization Keep America Beautiful in 1971.The irony of the organization’s name in this context would, I think, get a chuckle from Durham. Jimmie Durham, At the Center of the World at the Hammer Museum in Los Angeles ran from January 29–May 7, 2017. 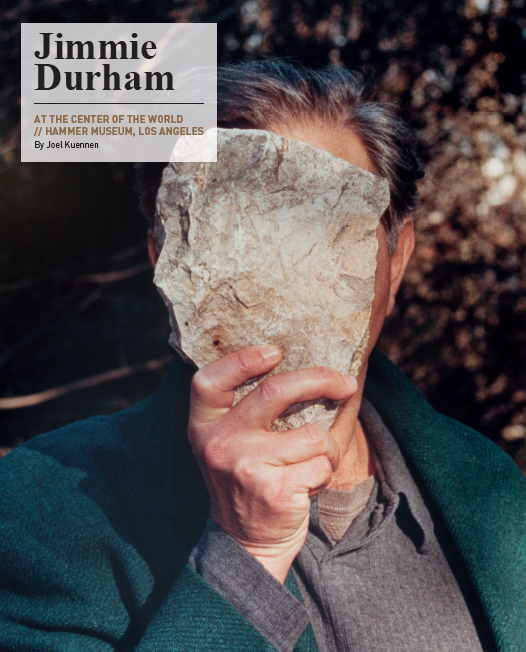 May 23, 2017 | Filed under Art Seen: National, PAST ISSUES and tagged with Hammer Museum, Jimmie Durham, Jimmie Durham: At the Center of the World, Joel Kuennen, The Seen.